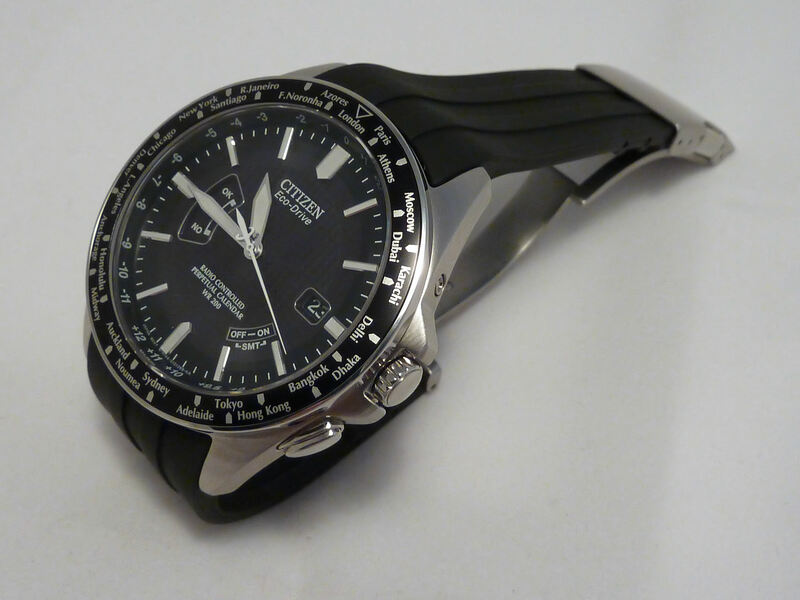 The watch featured today is the Eco-Drive A-T CB0020-09E also known as the World Perpetual A-T – a superbly made 42mm diameter, 11mm depth stainless steel Radio Controlled model from Citizen. World Calendar Citizen AT – Eco-Drive, perpetual Calendar, Radio Controlled, instant world time analog and only 11mm depth – a masterpiece! This is the rubber strapped version (a couple come with leather straps and a couple with bracelets are also available). And an excellent quality of silicon rubber strap it is too, with a nice double push button fold-over clasp. Like many other rubber straps however whilst it is adjustable it also tends to be a sort of final adjustment if you have small wrists as cutting is the name of the game, which is a pity. However as alluded to in my previous post, this is not the end of the world as this watch has standard case and lug arrangements, so a replacement alternative rubber or leather strap is easily sourced and fitted. As said the other versions come with alternative strap arrangements, but this is not the only difference. Whilst this model has a button @4 which is used to set the world time for example, the leather strap version has a recessed pusher instead. I personally prefer the button as it can easily be operated with the finger and not the end of a pen or other pointed object which may not be to hand. Another difference is the omission of a bezel – where this model is clearly marked with the city positions – the strap versions have no bezel and the city markers are tucked under the sapphire crystal and part of the dial. Those who are familiar with my blog will know I’m not a great fan of bezels, but in this case not only does it look well but I find it a little easier to read. And apart from some other minor variations the watches share the same functionality and internal mechanics. The flat sapphire crystal is anti-reflection coated and is very effective, especially as the internal dial markers and so on are not over chromed or reflective anyway and as a result the dark dial face has good contrast and is clear and easy to read. The movement is the H144 caliber and with radio receivers built in and Radio Controlled so assuming you can receive a signal from one of the 5 transmitting stations, then it’s pretty much the perfect time keeper – it’s stand-alone accuracy without RC is pretty much standard fare for this range of Citizens at around +/-15secs per month. Here in the northern hemisphere I point it south as the European radio transmitter is located in Germany and it manages fine – here it takes under 5 minutes (the instruction booklet says allow up to 15 minutes as it’s dependent on signal strength). After the update completes, the second hand returns to normal operation. The indication of success or otherwise can be checked easily – simply press the button once and the seconds multifunction hand will move to the little window @9 and point to OK or NO. Can’t be much clearer than that! Interesting system means this watch is a perpetual calendar until 2100 anyway – set the time and it sets the year, month and day automatically. 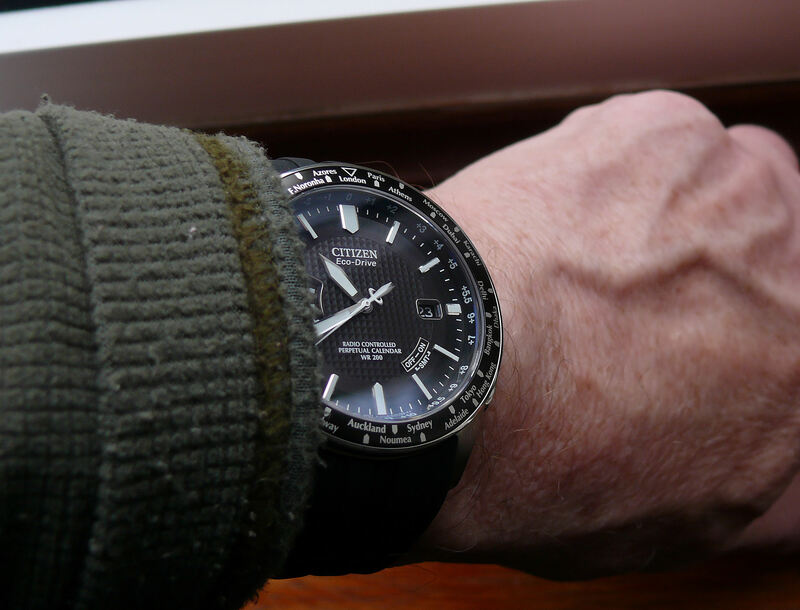 But note that only the date is shown in the window@3, it doesn’t display day or month like the ana/digi Citizen Attesa models, such as the ATV53-2833 (click for my review). Note – in case of problems the day, date, month and year can be set manually. There is also a quick set date concealed pusher @2 – so pretty much everything is catered for. Setting the world time in 26 cities and time zones from 0 to 12 with a couple of half zones in there, is a piece of cake – crown to position 1 and turning it moves the seconds hand (which doubles as a control pointer) to each city in turn. The hands follow automatically to whatever zone is selected. Daylight Savings time is indicated in the little window between the 4 and 5 o’clock position and will automatically be set when a signal is received. It too can be set manually if needed. 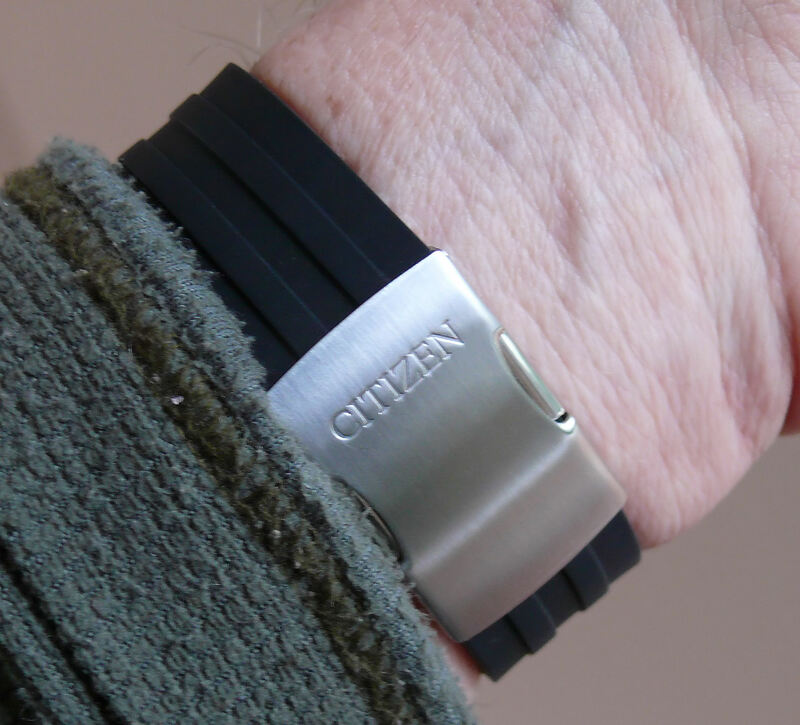 Being one of Citizen’s Eco-drive models it doesn’t require battery changes. Managing to power itself from available light, when fully charged it can run for 2 years with the power save function activated or around 6 months if not (Power Save is used if the watch is in the dark for 7 days – it stops the hands and deactivates the Radio Control receive function, but the watch continues to keep quartz time). Note that the watch will also not try to get a signal if the power is low – indicated by the second hand moving in 2 second intervals – another neat feature of this watch. Other features include a full reset, hand repositioning etc. and the Time and Calendar can also be set manually to allow the auto calendar function to continue after that. So all in all a pretty comprehensive unit, beautifully made, an excellent 200m Water Resistance, a very comfortable rubber strap and with sensible operational and safety features seamlessly built in. It can be found from around £230 in the UK, though fortunately I managed to find this one for less and coupled with the inclusive Citizen 5 year Guarantee I’m pretty pleased with this new and modern watch for my collection. In use this model has proved to be one of the best everyday watches I have and as a World Time model it is perhaps the best I’ve ever owned. Basically as it’s operation is so simple and foolproof. I have found in the past that some World Time models if not used for a while it can be tricky to remember the sequence required to set time zones or change back to local time. Very embarrassing on the plane when the chap next to you simply moves his 1 jewel Mickey Mouse hands back one hour and you’re still trying to figure out what to do with your all “singing and dancing” World Time watch! This model though is really, really easy – just pull out the crown, turn one click and an hour change is what you have – exactly.